Lamborghini President and CEO Stephan Winkelman finally lifted the lid on the much talked about Estoque, a four-seater, four door sports car study, that could give the Italian firm a third model in the line-up and take it in a completely new direction. Lamborghini President and CEO Stephan Winkelmann finally lifted the lid on the much talked about Estoque in Paris, a four-seater, four door sports car study, that could give the Italian firm a third model in the line-up and take it off in a completely new direction. Described by Winkelmann as a practical, user-friendly, 'everyday companion', the Estoque concept, which betrays the brand's sharp styling cues, is 5.15 metres long, 1.35 meters high and 1.99 meters wide. 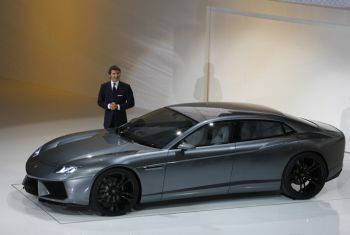 The choice of an four-seat coupé was a logical direction to take, said Winkelmann at the special unveiling, as the Italian brand already had two super-sports cars in its line-up: the Gallardo and Murciélago. "Today we are successful and profitable, and this is for us the basis of the two model strategy," explained Winkelmann. "If we want to go to the next step and grow further, the next logical step is to introduce a completely new model line, a third model. We looked into the entire market and we saw what was missing was a limousine which is at the same time elegant but very sporty." The Estoque, however, is just an idea for the moment with Lamborghini closely judging reaction at the show before making any decision to put the idea of a four seat car into production. "It is clear all my people would like to do it," Winkelmann said. "It depends on the reaction, and on the developments in the market," he added. Designed to be a comfortable and practical daily user option, Lamborghini has made much effort to offer a highly luxurious interior. "Entry and egress will be totally effortless, the big doors open wide, the seats are cushy yet supportive, there is plenty of legroom, and once you have made yourself comfortable, the low roof is never an issue," says Lamborghini technical boss, Mauricio Reggiani. 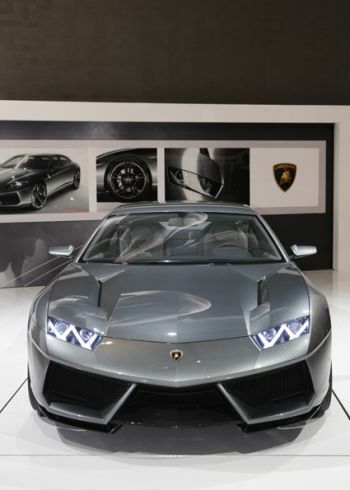 Winkelmann is highly confident that the Estoque will offer genuine Lamborghini performance. "We have to have the reserve of power that you need at all times. It’s more about the torque than the top speed for this kind of car," said the CEO. Production would be a big decision and involve major investment, admitted Winkelmann, as it would result in an increase production at the Bologna Sant'Agata factory by around a third. To realise this car Lamborghini would need to leverage further the technological capability and component sourcing offered by parent company Audi. Low and sleek, it would most likely share a platform with the Audi A8 and the next-generation Bentley Continental, as well as making use of Audi's four wheel drive system. "We would look at every possibility coming out of the Volkswagen group in everything," However Winkelmann, who was also optimistic that the brand could meet its 2008 sales targets despite the recent economic downturn, was cautious on sourcing too many parts, "It has to maintain the DNA of Lamborghini," he added, "otherwise you would destroy the value of the brand."